There has been quite a bit of negativity surrounding bloggers and influencers of late. Yes online bullies and trolls are an unfortunate part of the profile, but I’ve noticed a rise in criticism from the media and even followers, who behind the safety of their keyboards are attacking bloggers for everything from monetising their accounts to when they turn their baby seat around. I recently came under fire in the media when my children and I were made the “poster family” for something that I don’t encourage or believe in, let alone promote. As a result of this newspaper article, my images were splashed across the TV with an unrelated story – complete “fake news” for lack of a better term. I was actually interviewed for the piece but I guess my logical and ethical answers didn’t align with this journalist’s agenda and sensational headline, so she just left them out. After my own investigation, turns out this very journalist has made a nice little career of “exposing” and shaming those who have made a career through social media with many defamatory articles written about Influencers across all genres. “Special Investigation” she calls it *insert eyeroll emoji. Maybe it’s because mainstream media is struggling to compete with the rise of Bloggers with bigger readerships, maybe it’s because brands are choosing to spend their advertising dollars on Influencers rather than traditional media. Whatever the reason, this journalist has made it her mission to make “Blogger” a dirty word. Yes there is a lot of rubbish on Instagram. Shameless self-promotion, fame-seekers, unrealistic, altered pictures, and some seem they would sell their souls for a dollar… But there are also many accounts with integrity. With more than integrity. Many who use their platform to create awareness, make change, and inspire on both a micro and macro level. So why not bring attention to those? Obviously my Instagram experience is focused on the “mummy blogger” world and for me the sense of community and support found on this little app has become a “virtual mothers-group”- with true friendships made. The thing is we can choose to make our social media experience a positive one. We have the power by choosing who we follow and what we share. So after putting a call out on my own Instagram I have pulled together 11 inspirational accounts – big and small- some who their platform and profile to create change, some who inspire by sharing their story, some who do both. I know there are so many more and love for you to share in comments below. @mylifeof_love Rachael Cassella is my hero. This Sydney mother endured a nightmare scenario no parent should face when her daughter Mackenzie was diagnosed with Spinal Muscular Atrophy at 10 weeks of age. SMA is a terminal genetic condition and her Racheal was told her daughter would pass sometime before she turned 2. Rachael and her husband Jonny decided to travel with Mackenzie to give her as many experiences as possible. Mackenzie passed at 7 months and ever since Racheal has been campaigning for Genetic Carrier Testing. She has done so much for policy change in this area already with the Government investing $500 million for “Mackenzies Mission” raising awareness for prospective parents and medical professionals to have the testing that would prevent such tragedy. Rachel also shares her grieving process and IVF journey inspiring thousands of people to appreciate the smaller things in life. @confetti_rebels Empowered t-shirts and accessories inspired by women for woman, Supporting charities along the way. Creator Amy is a mother and a creative who has made it her mission to share kindness and positivity. Her feed will brighten up your day. @jessicasmith27 Cosmo Woman of the year, Paralympian, Speaker, MC, Author, Mother. Is there anything this woman can’t do? The body diversity activist inspires many with her daily accounts of motherhood, mixed with her inspirational work. @meg.boggs This new young mother spreads message of body positivity and no- judgment motherhood with her daily posts. @flavianamatata This supermodel’s personal story is inspiring enough. Being raised by her father in Tanzania after her mother passed when she was 9. Falaviana went on to study Engineering before representing her country in Miss Universe in 2007. Now not only is she in the top 7 models who have the highest incomes in Africa, but has become a business lady and advocate using her position to empower Tanzanian girls through education @flaviamatatafoundation I had the pleasure of socialising with Flaviana through our Amex Ambassador roles and she is so down to earth and lovely- a true inspiration. @houseofwhite_ I love Olivia for her authenticity. She’s as real as it gets, but positive and uplifting at the same time. She not only shows the real side of parenting, but offers lots of tips for family finance and is a body positive campaigner in the most natural way. She’s also created a nice little business for herself as an influencer and speaker and I enjoy watching other Boss Mamas killing it! 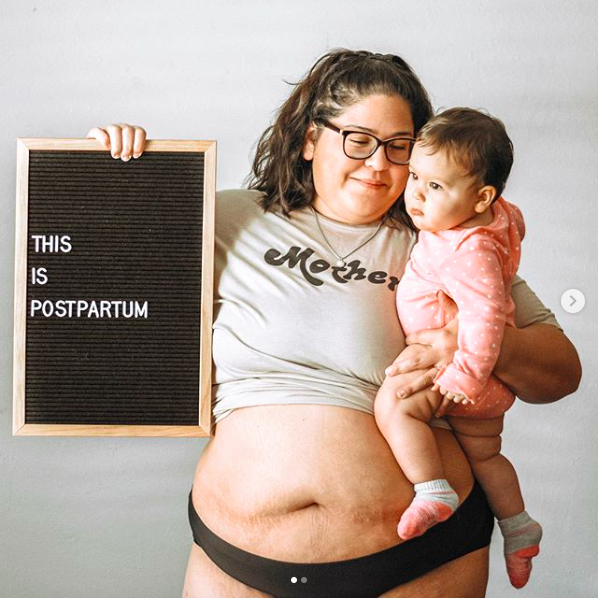 @justinezampogna Shares beautiful empowering posts and imagery on her Hypnobirthing account @dreamyourbaby. She recently shared her own heartbreaking, yet somehow empowering and beautiful experience on how she birthed her baby after being faced with the decision to terminate after her unborn child was diagnosed with Anencephaly. Justine is an inspiration for those dealing with pregnancy loss. @natalie__archer is a NY mama and founder of @theEndo.co a non profit fighting for the awareness, education & research funding for endometriosis. Female reproductive diseases is an area which needs much more attention, education and support. An area which needs much more support. Amberley is a mother, midwife and breastfeeding consultant who has made it her mission to ensure all mothers get the breastfeeding support they need in the early days of motherhood. Her page is full of supportive insights into breastfeeding and debunks many myths. Whether woman choose to breastfeed or not, I am also so passionate that new mothers have the best available resources and support to make their decision. This is something that is lacking in hospitals with so much conflicting advice flying around. If there is one piece of advice I give a pregnant mother who would like to breastfeed- follow Amberley!